Every collector and dealer is proficient with grading old coins. It is one of the key steps in determining an accurate value. The denomination and series of your old coin along with its date and mintmark finds its range of values on the charts. Judging condition and assigning a grade pinpoints how much your coin is worth - accurately. Awareness to subtle details is part of the art to grading a coin's condition. Using the Lincoln cent in the above image; notice the highlighted area of the reverse. Separated lines in the wheat stalk are very clear. This one element places the coin in the higher Extremely Fine grade. A subtle point, yes. However it is these and other points detailed in the grading series that are necessary and used to judge condition and arrive at a grade. Note: Explore additional information into the process of grading old coins detailed below the video index. 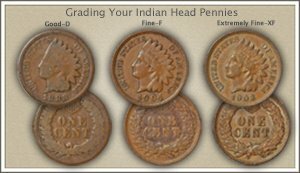 Indian Head Penny: Compare your penny to the close-up images in the video. You are looking for the presence of fine details in the headdress and hair curls. Between the "good" grade and the "extremely fine" grade are small but important points of judgment that truly affect value. Lincoln Wheat Cent: Last year of issue was 1958; these are now becoming very old coins. In today's market they are still plentiful (many were saved), however the ones in above average condition are gaining value and collectible status. Crisp and well detailed wheat stalks on the reverse indicates potential. 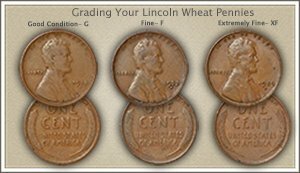 Points of interest are highlighted to help judge the condition of your old Lincoln pennies. Shield Nickel: Popular with today's collector because of their status as the "first of" nickel alloy five cent US coin. 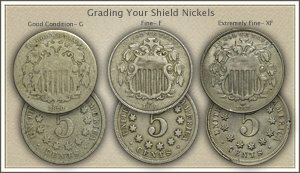 Grading the condition of Shield nickels involves both considering the amount of wear to the intricate design and weak striking problems the coins often display. Fine horizontal and vertical lines remaining with-in the shield sets your coin apart from most. 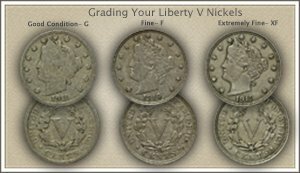 Liberty Nickel: Often these old nickels are heavily worn, making accurate grading necessary. Today however there is a strong market and interest in the higher grade Liberty nickels. Examples are notable if hair and wreath details are present. Key points to higher grades are small and close up judgement is needed. 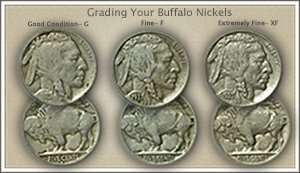 Buffalo Nickel: Popular and closely inspected for condition is the value market of Buffalo nickels. Keen eyes are often needed just to see the date. Other elements of the design such as the level of detail showing in Buffalo's horn are key to grade and value. Time spend judging condition often pays dividends. 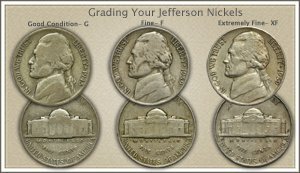 Jefferson Nickel: With a little time and a close-up look at your coins. Judging the difference between circulated and Mint State Jefferson nickels becomes eaiser. It is where the value difference accrues. Attention is given to the steps necessary determining the Uncirculated (Mint State) grade. A magnifying glass 5x power is helpful. 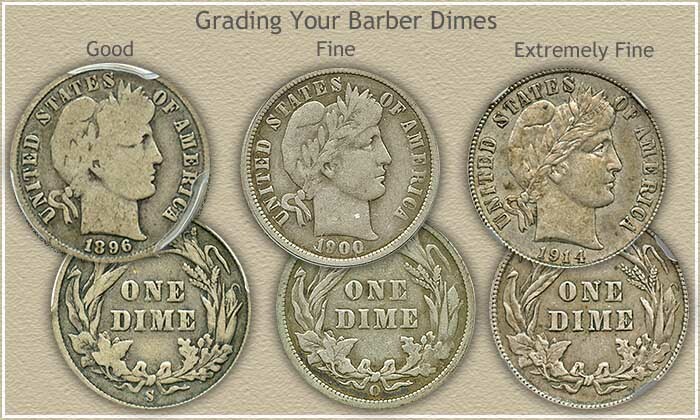 Barber Dimes: Of all the remaining Barber dimes today a significant number are in heavily worn condition. Determine your old dime is in nice condition and it becomes a desired collectible. Judging condition and grading is a process detailed in the grading video. Recognizing the small details and important elements to the different grades are also highlighted in close-up images and descriptions. 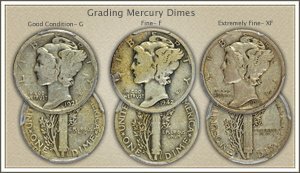 Mercury Dimes: In the Fine grade many Mercury dimes enter the premium value collector range. Early dates are highly sought. Wear to the surface is judged and overall condition is inspected. Details of the key elements to grading are presented in the video, descriptions and images. With your coin in hand, compare to the images to confirm a grade. 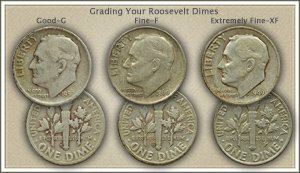 Roosevelt Dimes: Your primary consideration in grading Roosevelt dimes is the confidence of separating the bullion silver dime pieces from the higher value collectable ones. Minimum value is$1.12 as of4/15/2019 . However, dimes in high grade are worth a premium. Descriptions of the different grades with close-up images and the grading video highlight the process of grading these old silver dimes yourself. Although few; there are certain dates and mint marks to spot and judge their condition separating them into the collectable group. 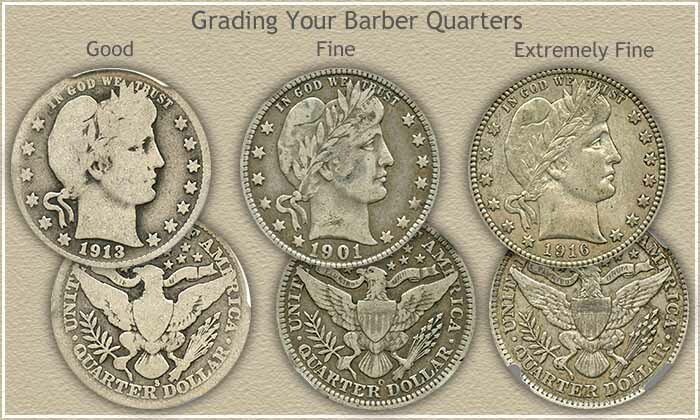 Barber Quarters: Most Barber quarters are found very worn and as a result are valued close to their silver value. Grading becomes important if the coin is in above average condition. The large price differences are the result of small differences in wear. Detect these value points with close-up images, descriptions and following the grading video. 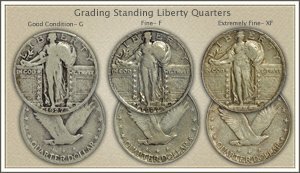 Standing Liberty Quarters: Grading Standing Liberty quarters requires a recognition of the standards for the grade. Video plus descriptions cover the areas deciding the different conditions. Further study into the two special situations involving the design of the date area and quality of strike are also needed to accurately arrive at a conservative grade. Collectors searching for special qualities on the coins; full date and full strike; add to the grading process. Washington Quarters: Follow along with the video and pick up the subtle points to grading Washington quarters. As of 4/15/2019 all silver quarters are $2.80 . Close up images and descriptions help find coins in better than average condition. 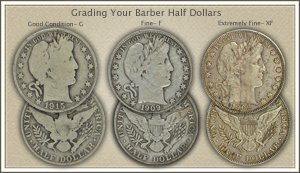 Barber Half Dollars: Grading the condition of Barber half dollars has become key to determine the coin's value. Judging the amount of wear to the surface follows a set of critical points. Wear to high points defines the Extremely Fine grade and further wear places the coin in other separate categories of condition. Images and detailed descriptions of the factors used to judge condition are presented follow along with the step by step video. Comparing your coins to the images soon gives a good indication of grade. 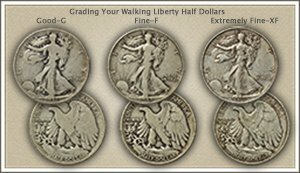 Walking Liberty Half Dollar: Popular today with collectors, a deliberate effort grading the condition of your old half dollar often discovers something special. It is possible to accurately grade these coins yourself. Small changes in the amount of wear, once described, are soon recognizable and your expertise quickly improves. Date and mintmark are important - and now you can decide condition as part of an accurate appraisal. 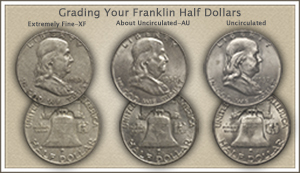 Franklin Half Dollar: In the grading video - watch closely the difference between an "uncirculated" and "about uncirculated" half dollar. It is these two grades that separate the higher value coins, with the uncirculated coin at the top of the value charts. Specific areas of the obverse and reverse of your coins are highlighted to make the distinction. 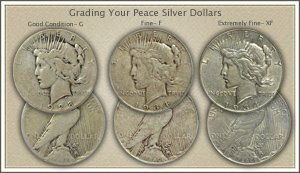 Peace Silver Dollars: Peace silver dollars have their own subtle set of grading factors. Locations of small details of the design are identified to examine. Awareness as to how well the coin was struck - bold to soft- are identified and judged. Metrics to confirm the difference to the grades are used to accurately define condition. Peace dollars with an intrinsic silver value are separated from the higher collectable premium coins. Combine the video with its highlight of the important Mint State grade and details of grading standards to accurate determine condition. 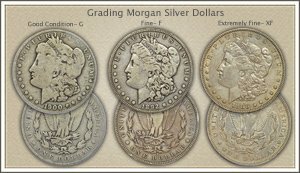 Morgan Silver Dollars: Proceed through a process of recognizing and judging key elements separating the different grades. Examples of grades are examined and deciding factors to grade are highlighted. 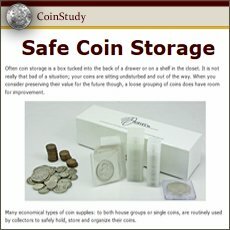 Further study with images and descriptions help recognize the condition of your coin. Additionally, visual appeal is increasingly important to the grading process; separating above average for the grade. Grading coins is part technical judging of the surface and importantly aesthetic qualities of is appearance. Newly minted coins are noted for their brightness and completeness of original detail. Mint State examples of coins are free of any wear to the surface. A bright shine remains on many and toning is often found on the surface as well. The absence of wear is the important judgement that sets these apart from a circulated coin. Each series has its key high points of the design to inspect to confirm the grade. Even if your coin is worn it is helpful to examine closely a mint state example of the coin. Knowing the extent of detail to the original design elements improves the judging of the amount of wear. Wear to the surface is beginning to show. However, only minor evidence of wear is noticeable on the highest parts of the design. These coins retain all major elements bold, and the majority of the finer details sharp. An added plus are remnants of luster. Look closely within the lettering, likely along the rim to find any luster. In the Fine grade, coins are beginning to show areas of flatness and design elements merging. Fine details are fading, missing in areas and replaced with a flat surface. Major elements to the design are still well presented and bold. The majority of the surface is worn to a flat plane, indicating the good grade. Key essentials are a readable date, mintmark and no damage. These coins are heavily worn, however portraits and most lettering remain. Visually appealing coins have a certain pleasing character avoiding a "worn-out" look. A clear well-lit area is needed when grading coins. Additionally, a single light source is used to highlight the coin's surface. Also a 3x to 5x magnifying glass is best to gain a close-up view. Examine coins over an open table top and hold each by the edges to avoid touching the central areas of the coin. Rotating and tilting the coin is part of the grading process to bounce light off at different angles. The affect is to highlight luster if any is present and identify marks and nicks. Faint details are often detected by using magnification and good lighting. Eye appeal is an important part of grading old coins. Aesthetic qualities are judged along with the amount of wear a coin displays. In a broad sense; is the coin pleasing? Absence of large marks, noticeable without magnification adds to higher qualities. Judge the prime focal points; faces of the portraits, dates and centers of reverse designs. Coins develop toning as they age, worn coins take on soft hues of the copper, nickel, silver, and gold of their alloys. Uniform natural toning enhances the appearance and appeal. Dark discoloring of the surface is found on occasion. Scattered dark spots are also encountered, each lowering eye appeal. Examine the rims, undisturbed, without visible bumps, is also a plus. Clarity of key elements adds enhanced qualities. Easily readable dates, lettering separate of the rim and major design features bold from the fields. All are features of the coin to judge and note. Worn coins are often well received if displaying a pleasing eye appeal. Technical judgement of surface preservation and visual appeal are both combined to determine a coin's collectability which is directly connected to value. It is an excellent index with images and text links to all coin series, from Cents to Gold. Value charts combined with the Grading Old Coins Video Series discovers the common to rare found in your box of old coins.